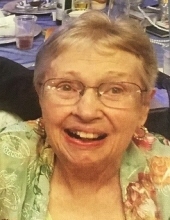 Janet C. Jones, 87, DuBois, passed away Thursday, February 7, 2019 at Christ the King Manor. Born November 14, 1931, in Lewistown, PA, she was the daughter of the late George L. and Ida (Johnson) Ganoe. On June 27, 1953, she married Rev. George P. Jones. He preceded her in death on March 2, 1998. Janet graduated from Lewistown High School in 1949 and went on to attend Nyack College. She was a consecrated worker in the Christian and Missionary Alliance Church until her retirement in 2006 when she moved to the DuBois area. Her whole heart was dedicated to serving and sharing the love of Jesus with others. She served with her husband in Darlington, Philipsburg, Mars, Lawrence Park (Erie), Uniontown, and Blairsville churches before returning to the Mars church. Janet was a member of the Alliance Women’s Group. She loved spending time with her family and friends. Janet is survived by three children, Glenn (Jamie) Jones, Lusby, Maryland, Susan (Kevin) Thomas, DuBois, and Jann C. Jones, Indiana, PA, six grandchildren, and a brother, Glenn Ganoe, Grantham, PA.
She was preceded in death by her parents, husband, and a brother, Richard Ganoe. Friends and family will be received Sunday, February 10, 2019 from 2-4 p.m. at the Adamson Funeral Chapel, Inc. Following the visitation, a funeral service will be held at 4 p.m. from the funeral chapel with Pastor Bruce Ward and Rev. Paul Cope officiating. Interment will be in Mars Cemetery. Memorial donations may be made to the DuBois Christian and Missionary Alliance Church, 1004 S. Main St., DuBois, PA 15801 or to the Mahaffey Camp and Conference Center, 1559 Mahaffey Grampian Hwy, Mahaffey, PA 15757. To send flowers or a remembrance gift to the family of Janet C. Jones, please visit our Tribute Store. "Email Address" would like to share the life celebration of Janet C. Jones. Click on the "link" to go to share a favorite memory or leave a condolence message for the family.